CHRISTIANSTED – Tired of watching Anthony Bourdain jet off to exotic locations around the globe and eating food from places you’re not sure you can afford to visit? Don’t have the $1,500 it costs to fly from the 10,185 miles from St. Croix to Vietnam? Well, Bourdain’s current favorite destination for delicious exotic food – Vietnam – is now just around the corner in St. Croix – in the form of its cuisine at the Saigon Deli in Estate Mt. Welcome just West of the Canegata Ballpark. All Vietnamese cooking is supposed to be a balance of the five elements (ngu vi) spicy (metal), sour (wood), bitter (fire), salty (water) and sweet (Earth). The five nutrients (ngu chat) are also generally found in every meal. They are: powder, water, mineral, protein and fat. Each Vietnamese dish has a distinctive flavor which reflects one or more of these elements. Common ingredients include fish sauce, shrimp paste, soy sauce, rice, fresh herbs, and fruits and vegetables. The first thing I ordered from the menu when I first walked in the door, was the beef stew with bread, which can be served with noodles or rice alternately. Mine came with a white flower on top. I meant to ask if it was edible (I’m sure it was). But I did not eat the garnish. Maybe next time I order the same dish, I will. (Chef Kent assures me later that it was an edible dragon flower). Vietnamese recipes use lemongrass, ginger, mint, Vietnamese mint, long coriander, Saigon cinnamon, bird’s eye chili, lime and Thai basil leaves. With the balance between fresh herbs and meats and a selective use of spices to reach a fine taste, Vietnamese food is considered one of the healthiest cuisines worldwide. Chef Kent said the number five is significant in Vietnamese cooking because it represents the five elements of the Earth. And something I noticed when I tried the Vietnamese staple, the beef noodle soup or “pho” in the Vietnamese, Chef Kent delivers four of the five colors clearly visible in the ingredients of the transparent broth soup (black) with cellophane noodles (white), spicy hot peppers (red and green) that the chef said should be eaten as soon as it is served because many of the ingredients have just been added to the bowl prior to being set in front of you. “I think more people are going to be asking for this for breakfast when they see how good it is in the morning,” Chef Kent said, adding that the broth takes 15 hours to produce as it uses the beef bone and marrow for the indescribable broth that even Bourdain raves about. I remember reading Jane Brody’s food column in the New York Times and she has always sworn by eating soup in the morning for a change of pace. If you want to follow Brody’s advice, there is no better place to start than at the Sai Gon Deli and the pho soup (pronounced FUH), which Chef Kent said is his best-selling item on the menu. Of course, the official name of the capital in communist Vietnam is Ho Chi Minh City, but even the locals today prefer to call it “Saigon,” the name it held before the capital fell in 1975 to the North Vietnamese as I found when I visited the city in 2007. “They stole my country,” Chef Kent reminisced, adding that he is happy and proud to have made America his new homeland, and to have served the South Vietnamese Army as an officer with support from the United States military. Most of the food can be ready in five minutes, so in a territory where even fast food franchises give new meaning to the long wait for food that is supposed to be ready in a jiffy, this menu is actually built for speed. Kent is assisted in the kitchen by Chef Mark, who is a U.S. military veteran from Georgia, and cooks up the tasty Thai deep fried dumpling treat Crab Rangoon for appreciative repeat customers to the deli. It is a “crab puff” appetizer with cream cheese, fresh crab and scallions. Occasionally, when the free diving is good in the nearby lagoon in Gallows Bay, the Saigon Deli offers a lobster salad that everyone in St. Croix who is not vegan or vegetarian should try at least once. The beef or chicken pho soup, like many items on the menu, have a vegetarian alternative. So just ask your exceptionally attentive and polite wait person if you have a preference for meatless dishes. The stir fry with tamarind sauce, lemongrass noodle salad, egg rolls, spring rolls and rice with egg cake are some of the most popular vegetarian items on the menu, according to Chef Kent. Chef Kent regularly comes out of the kitchen to talk to customers about the food they have just eaten (as time permits). He said that he hopes to one day soon start a shrimp and talapia farm here on island so that he can supply not only his restaurant, but others with a consistent and ready supply of fresh seafood. The shrimp and talapia farm could also generate fertilizer for an “Eco Garden” of exotic fruit and vegetables where he would grow hard-to-find items like dragon flower fruit and dragon beans (I tried a few raw and they were crisp and bright – kind of like a flatter, serrated snow pea pod). The food not only delivers “mouthpleasure,” as Wikipedia put it, but will leave your taste buds and mind wondering long after you leave when they will again be treated to flavors that they have never tasted before. The majority of the items on the menu, which are conveniently numbered on a lit sign at the front of the restaurant where you order, can be sampled for less $10. If you like coffee and want to beat the heat, I recommend the Vietnamese iced coffee ($4) (which contains no sugar but is mixed with sweetened condensed milk) which is slow-dripped to perfection and is the perfect antidote to a sluggish, hot afternoon in the tropics. On Saturday evenings, beginning at 6 p.m., the Sai Gon Deli features live performances by Jazzy Blue and his mellifluous melodic sounds. That’s tonight, so come on by. If you’re wondering how popular the restaurant is, the news is spreading about the small Asian deli. One time I saw two prominent Realtors and a local moving and shipping executive. Another time I saw local political activist Glen E. “Butcher” Brown. And still another time a group of high-tech engineers who sell software for television to the Associated Press were at the deli along with a prominent marketing guru from Atlanta who has recently moved to St. Croix. So the movers and shakers of the future for the territory find the Sai Gon Deli the place to go if you’re in a hurry for lunch or dinner. The restaurant is open Tuesday through Friday from 11 a.m. to 3 p.m. (lunch) and from 5 p.m. to 9 p.m. (dinner). On Saturdays, they are open from 5 to 9 p.m. 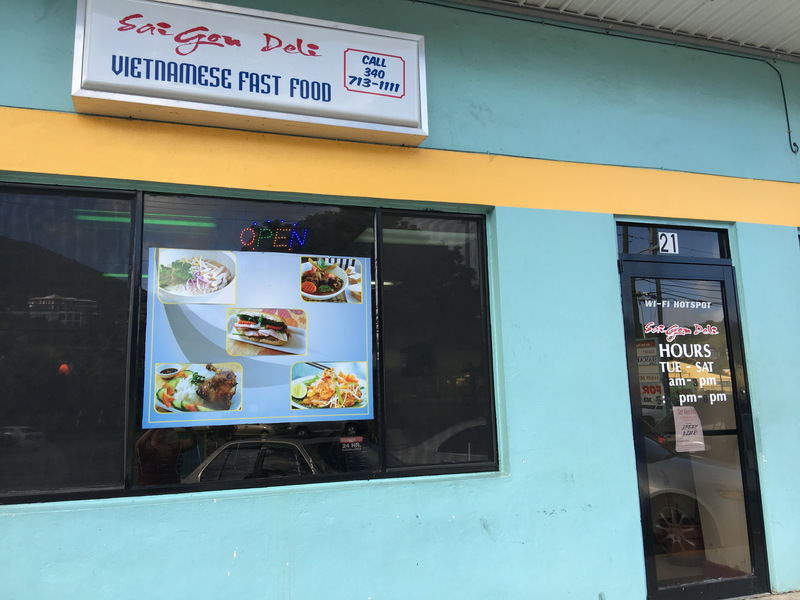 The Sai Gon Deli is located near the eastern end of the Christiansted bypass in the mall next to the Frederick Building insurance and laundromat. Their number is (340) 713-1111. Give Chef Kent, Emily, Katie and Wendy a call – and tell them I sent you! 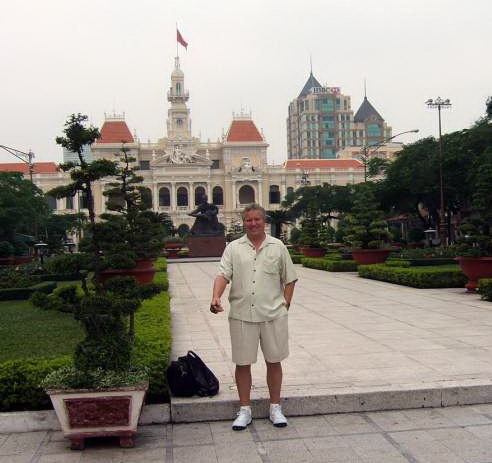 John McCarthy in Saigon in 2006.